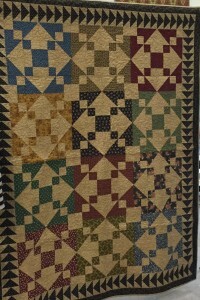 Kathi used the Texas Two-Step block to create this incredible quilt. The center section appears to be on point but is actually a straight set. It is the diagonal line in the block that creates the illusion. The triangle units that extend into the inner border are partial blocks. Sara said “I really enjoyed that setting and the block. 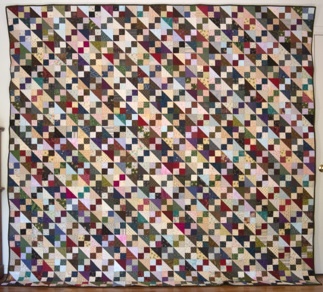 I love scrap quilts and I love how so many ugly fabrics turned into something special.” This quilt was started in one of my classes. I love the set Sara chose. Growing old is mandatory. Growing up is optional. Laughing at yourself is therapeutic. Carolyn Lopez took the Texas Two-Step lap quilt class the very first time I taught it at a Quilt Guild of Greater Houston retreat. 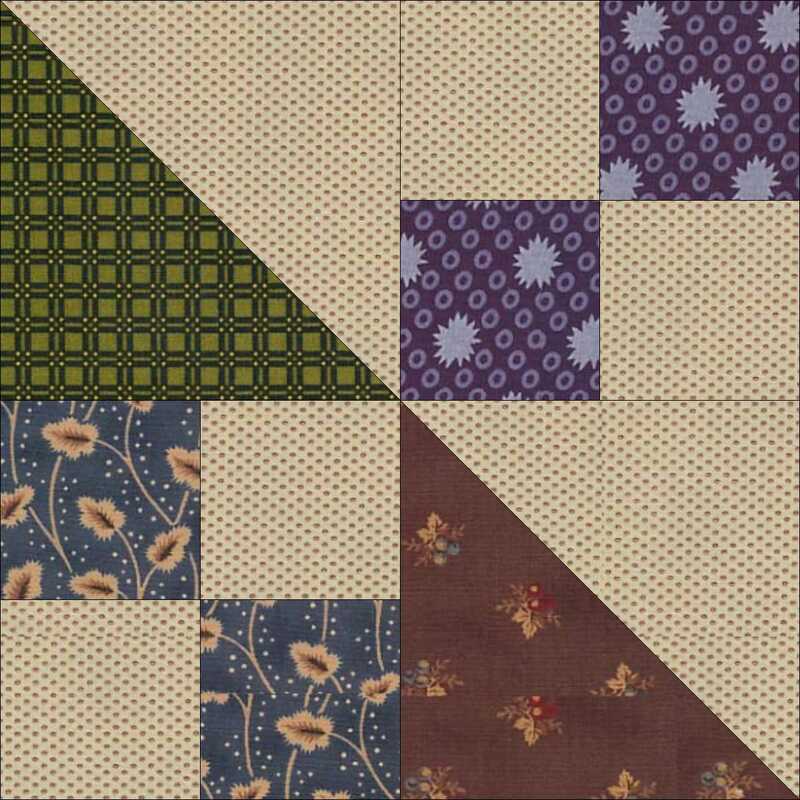 The block has a diagonal line which makes many different settings possible. Carolyn managed to come up with a set I had not seen. I was delighted. This quilt is an example of what I call “related fabrics” which in this case is Civil War reproductions with a common background. 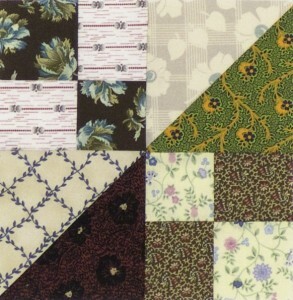 Texas Two-Step block with reproduction fabrics and a common background. One of the great things about scrap quilts is that you don’t run out of fabric. This means the size of the quilt can be determined after the project is started. 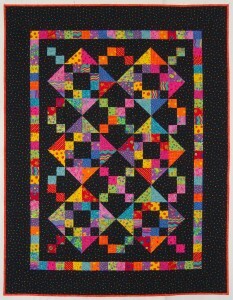 Karen Guerra began this quilt in my Texas Two-Step lap quilt class at Festival in 2008. 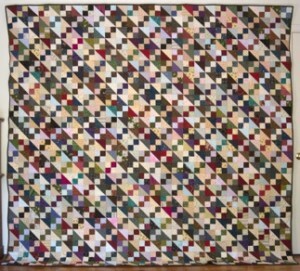 She just kept making blocks until she had this wonderful king size quilt. When I was driving from Houston to Atlanta for the birth of my first grandchild, Lillian, I stopped at quilt stores along the way. I bought fat quarters of what I call “children’s brights”. It is so much more fun to shop if you have a project in mind. 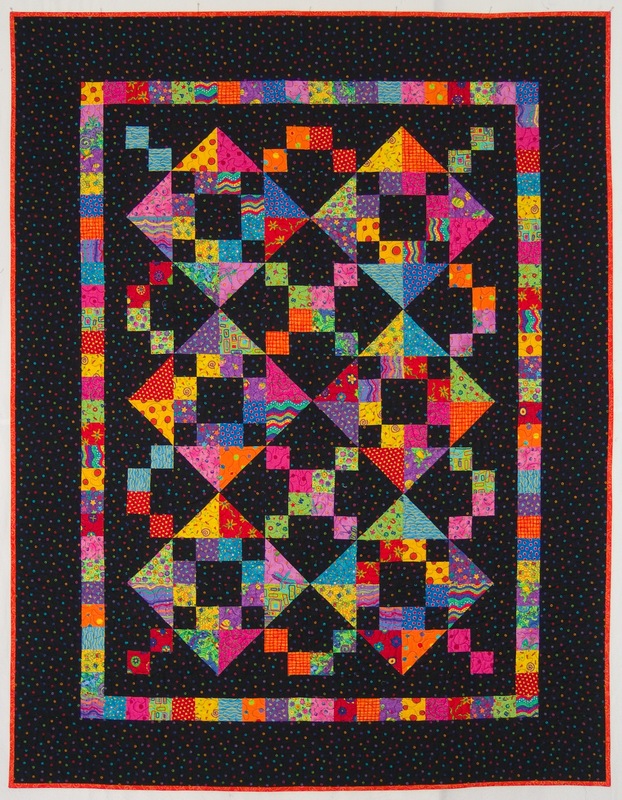 With this quilt I used a common background that was darker than the “children’s brights.” I had an adorable dark blue airplane fabric that was not used because there was not enough contrast between it and the background. 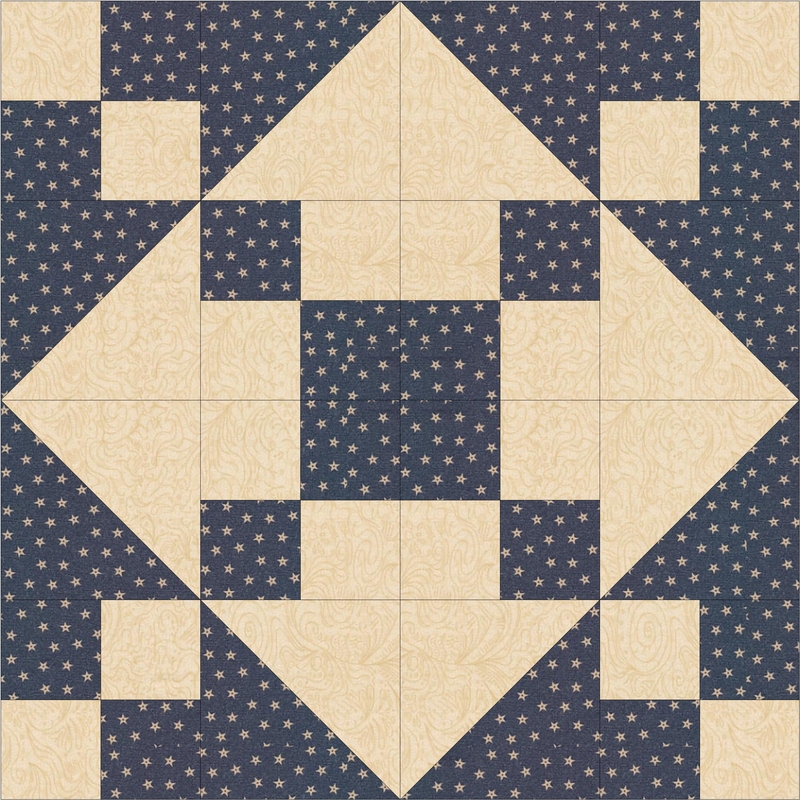 The blocks are 8″. The squares in the blocks have a finished size of 2″. To make a pieced border fit I find it best to base the border math on the math used in the quilt. 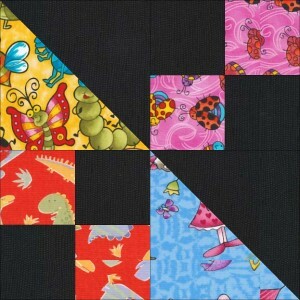 I made a 2″ black inner border, a pieced border of 2″ squares and then an outer black border. The fabric does not show in the photo but it is a polka dot with many bright colors on the black. The Texas Two-Step block is shown below. The block has a diagonal line which makes many sets possible. 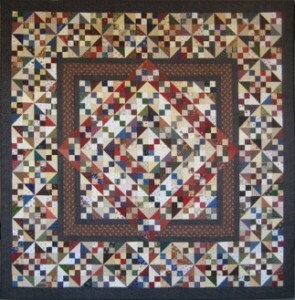 My husband set up my blog and choose one of my Texas Two-Step Quilts for the first post. I love scrap quilts. 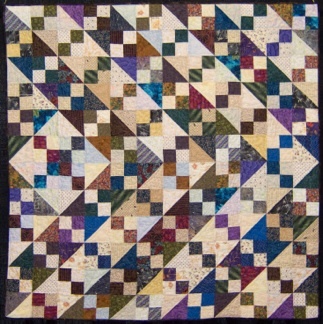 The pattern in scrap quilts is determined by differences in value. 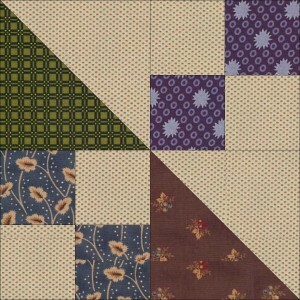 For this quilt my Friday Bee chose a “light” common background to be used with medium/dark reproduction prints. 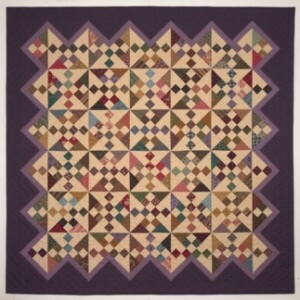 Texas Two-Step Quilt On-point set framed with purple. 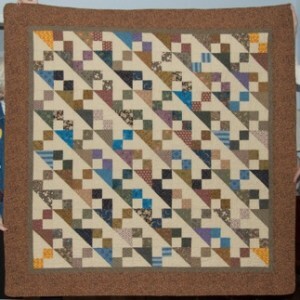 Once the blocks were made and put in a straight set on the design wall the quilt was boring. Setting the blocks on-point and framing them with purple saved this quilt. Mary Ellen Hopkins said “Purple goes with everything”. I am a believer!! !